Some of us were privileged to see James P ghosting past defenders as if they were not there. Jimmy remains our all-time top goalscorer with a phenomenal 266 Spurs goals to his name. Harry Kane is now more than halfway towards Greaves' record and week after week gives hope to those seeking to use a Bet365 bonus code in bets such as first goalscorer, or "to score in a game". Jim, like so many of his generation, was born in the East End of London during the phoney days of World War II which saw the Germans and the Allies blinking at each other during the first six months of the war. Greaves was born at the height of the worst winter in a 100 years, although that was classified information at the time. There was no indication that a footballing phenomenon had been born on 20th February 1940. Greaves grew up during the war years and soon became a Spurs supporter, preferring to trek from the East End to White Hart Lane rather than the nearer Upton Park at a time West Ham were nothing more than Second Division nonentities. Spurs were exciting to watch as they had invented the concept of push and run rather than hoofing the ball and hoping it would be a damn long time before the ball came back. During the autumn of 1954, it looked likely that Greaves would join the Tottenham staff but, at a vital moment, manager Rowe collapsed with the worry of the likelihood of relegation as his side grew too old. Greaves was quickly taken under the wing of one Jimmy Thompson, a one-man Pied Piper, who led so many East End boys to Chelsea, particularly players like Peter Brabrook, Barry Bridges and others. Greaves was a smash hit in the Chelsea Youth side. In the 1956-57 season, he scored 114 goals for the Chelsea Youth team. I was there at the start of it all. I was only 13 at the time when, on August 24th 1957, Greaves made his debut for Chelsea. Typically, he did absolutely nothing at all apart from scoring Chelsea's goal that salvaged a 1-1 draw. That was typical Greaves. For 89 minutes, he would do absolutely nothing worthy of mention, spending most of his time chatting to anyone who cared to exchange pleasantries with him. But his instincts were razor sharp and he very rarely missed a chance presented to him on a plate. During the 1960-61 season, footballers were increasingly restive as the Players Union, led by Jimmy Hill, fought to improve their wages. They felt they should be paid for what they were worth rather than what the Chairmen thought they could spare. There was talk of a strike but it fizzled out when the Football League conceded the players had a case. In the meantime, Greaves could not wait and agreed to transfer to AC Milan. No sooner had that deal been concluded than the Football League agreed that players could be paid what their clubs could afford to pay. It soon became evident that Milan were not happy. Tottenham were first to make a bid for Greaves which Chelsea countered. Tottenham increased their bid at which point Chelsea dropped out. Greaves could not sign for Tottenham fast enough when offered a contract to sign. But the Football League were not happy about the transaction and refused to allow Spurs to play Greaves for three weeks until they were sure there had not been any wrongdoing involved in the transfer. Greaves' first appearance for Spurs was actually for the Reserves at Plymouth Argyle. But on his debut for Spurs on 16th December 1961, against Blackpool, Greaves scored a hat-trick (Les Allen grabbed the other two goals) in a 5-2 thrashing of the seasiders. No one who saw the spectacular bicycle kick that scored one of the Greaves' hattrick will ever forget it. Before Greaves made his debut, the Spurs had been mis-firing with Smith injured and Allen suffering a lack of confidence. Greaves scored 21 goals in 22 League appearances. It almost proved to be enough to take the championship back to Tottenham but Spurs failed to beat Ipswich, which cost them the title. But Greaves did score a goal in the Cup Final against Burnley, which ensured they retained the Cup. In his first full season for Spurs, Greaves broke the club record for scoring goals in a single season. Ted Harper (1930-31) and Bobby Smith (1957-58) were the joint holders with 36 goals. Greaves created a new record when he scored in a 4-2 win over Sheffield United on 4th May 1963 but failed to score in the remaining three games of the season. Only Greaves the following season and Clive Allen (1986-87 with 33 goals) have remotely came close to approaching the record since Greaves created it. The 1962-63 season was one of the worst winters (apart from 1946-47) football has ever known. There was hardly any football after Boxing Day until the beginning of March so it was amazing Greaves was able to create his record. But Spurs also made history on another front when Spurs won the European Cup-Winners Cup, thrashing Atletico Madrid, 5-1. But the star that night was little Terry Dyson, who harried the Spanish defenders all night. Greaves scored 35 goals from 41 League matches the following season. Spurs were at their best in the autumn when Spurs thrashed Blackpool and Birmingham City 6-1 in a spell that saw five successive wins after Spurs had been crushed 7-2 at Blackburn Rovers. Greaves scored 29 goals from 41 matches during 1964-65. The side was in the throes of rebuilding and they finished a creditable sixth in the table. Alan Gilzean joined Spurs in December from Dundee and soon built up a telepathic understanding with the bubbly Cockney. But the season's funniest goal came right at the end of the season in a match against Leicester City. Spurs had been awarded a penalty against Leicester City for reasons I have long since forgotten. Gordon Banks was drying his hands in the back of the goal when Greaves cheekily plonked the ball in the net. The referee awarded a goal and Banks pursued the referee to the centre circle protesting he had not been ready. For his trouble, Banks was booked for dissent. Overshadowing the 1965-66 season was the World Cup due to take place during the close season with the final at Wembley on 30th July 1966. 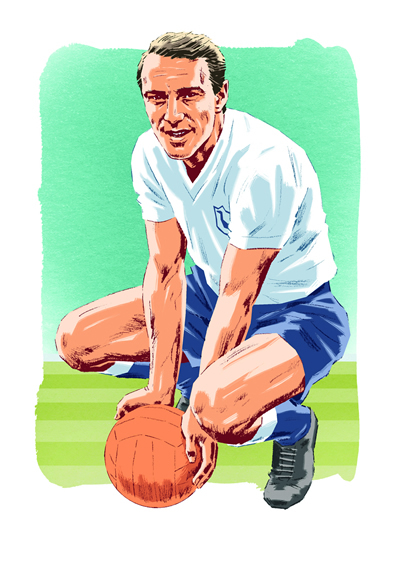 Greaves' chances seemed to have disappeared when he was taken ill with hepatitis B after the game, in which he had scored twice, against West Bromwich Albion on 30th October 1965 and Greaves did not reappear in the Spurs side until 29th January 1966. Spurs beat Blackburn Rovers 4-0 and Greaves scored a penalty. Season 1966-67 saw Spurs finish 3rd in the League, behind Manchester United and Nottingham Forest, and emerge as winners of the FA Cup. Spurs had new players in Mike England, dramatically signed from Blackburn Rovers on the eve of the new season, and Terry Venables, who had been signed from Chelsea after the transfer deadline but who had made his debut in the final game of the previous season. Spurs would have won the Double again but for a period of six matches during October and November when a series of silly errors cost them three home defeats. The third was marred by a highly inexplicable penalty miss against West Ham by Greaves. But Greaves was again Tottenham's leading goalscorer, scoring 25 goals in 38 League appearances. A disappointing feature of the season was Spurs failure to make much impression on the European Cup-Winners' Cup, which turned on Mullery's dismissal in the away leg for violent conduct and silly defensive errors in the home leg, that ensured Olympique Lyonnaise progressed via the away goals rule. Season 1967-68 was another disappointing season. The highspot of the season came in the Charity Shield when Pat Jennings scored an amazing, wind-assisted, goal in a 3-3 draw. Spurs best performances came at the start and end of the season when they thrashed West Ham 5-1 in August, Burnley 5-0 in March and Southampton 6-1 in April. But Greaves only scored 23 goals from 39 appearances. The following season, 1968-69, was Greaves last full season at Tottenham. He scored 27 League goals from 42 matches, the only season I believe he appeared in every match. The best goal of his career was scored in October 1968 against Leicester. Unfortunately there were no TV cameras to capture the goal but those who saw it will know why I acclaim it as his greatest goal. Jennings booted the ball out to the wing where Jimmy had wandered. He killed the ball, spun round and was away before his marker had realised he had gone. Greaves danced around four or five defenders, even raced around the referee, drew Shilton and plonked the ball in the net. The goal ultimately condemned Leicester to relegation at the season's end as their results were similar to Coventry's. But the ugliest moment of an unhappy season came in the League Cup semi-finals where we played Arsenal. Radford had snatched a slight advantage thirty seconds from the end of the first League at Highbury. The second leg at Tottenham was a horrible affair. Certain Tottenham players (they know who they are!) were bloody lucky to avoid dismissal for an early bath. Greaves scored Tottenham's goal but it wasn't enough. Radford had the last word with another very late goal. Stand up the person who shouted "Swindon Town!" - clever boy! - Swindon went on to beat Arsenal in the Final. Spurs were sliding down the table to midfield anonymity. Bill Nicholson fidgeted restlessly during the autumn of 1969-70. And Greaves was the focal point of his fidgeting for he only scored 8 League goals in his final 29 matches for Tottenham. Gilzean scored 10 that season. But it was the way that Spurs surrendered at Crystal Palace in a Fourth Round cup-tie replay that led to the axe falling. Those who were there still have nightmares about that match. The memory of the headlines "QUEEN WINS THE GAME FOR PALACE!" still haunt me. It was a truly diabolical game as I am sure others who were there will confirm. Greaves was the only casualty of that match. He never played for the first team again. He was chosen to play for Spurs Reserves against Arsenal Reserves at Highbury for his final competitive appearance in a Spurs shirt. The Match of the Day cameras were there to capture the highlights. Soon afterwards, Greaves had gone as makeweight in the deal that brought Martin Peters to Tottenham from West Ham. Greaves played for a season for West Ham and then quit. He quickly went downhill as his alcoholism took hold playing for Barnet, Chelmsford City, Brentwood Town and Woodford Town before finally calling it a day. (Editor's note:-) Jimmy Greaves rebuilt his career, as a very popular TV pundit, but switched to other avenues in recent years. Until he suffered a severe and life-threatening stroke in 2015 Jimmy had a regular newspaper column, and also entertained around the south-east with his after-dinner speaking and theatre appearances, when he reminisced about the old days, with the likes of Ron "Chopper" Harris, and our own Pat Jennings. Greaves entertained those of us lucky enough to be at the Double Re-union dinner in 2001, and returned to White Hart Lane in November, 2004 to speak eloquently at Bill Nicholson's Memorial Service. Jimmy remains as popular as ever, and is the author of several published books. Jimmy was scheduled to be inducted to the Tottenham Hotspur Hall of Fame in 2015, before his illness led to cancellation. Now, although he could not be present due to his state of health, Jimmy was formally inducted on 20th April, 2016, along with Steve Perryman. Both players would have been inducted years ago, were it not for disagreements with the club over the nature and purpose of such events.